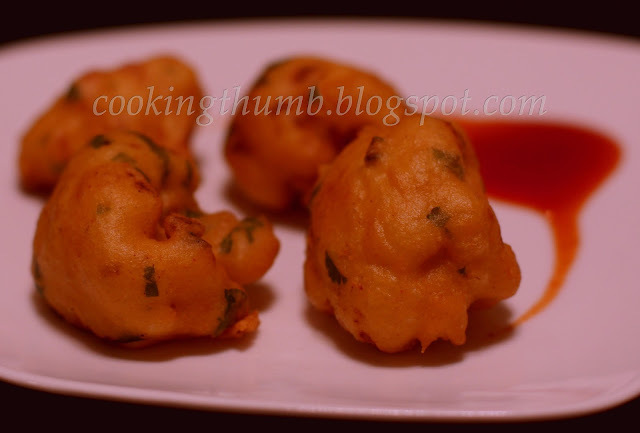 Gobi Pakora (Cauliflower fritter) belongs to the family of the ubiquitous Pakora (also called Bhajji or Bhajiya) - the tasty, crunchy, golden-brown Indian snack that is a tea-time favorite of every Indian household. In addition to gobi, A plethora of veggies can be used to make Pakoras - Aloo Pakora (potato fritter), Pyaaz Pakora (onion fritter), Mirch Pakora (bell pepper fritter) to name a few. The trick to the perfect Gobi Pakora is making sure that the batter-covered cauliflower floret is well-cooked on the inside. Most cooks parboil the florets but it destroys the taste of the cauliflower. I learnt a little trick from my mom to make the perfect Gobi Pakora without boiling - that keeps it well-cooked on the inside and crispy on the outside. Cut the cauliflower into medium-size florets. Wash the florets thoroughly and drain the water. In a bowl, mix the gram flour & corn starch. Add water gradually enough to make a smooth & thick consistency batter. Batter should neither be too thick nor too watery. Add turmeric powder, red chilli powder, salt, green chillies, cilantro leaves to the batter. Mix well. Heat oil in a deep pan/wok on medium heat. Once the oil is hot, dip each cauliflower floret in the batter such that it is well-coated. Gently slide the coated florets one by one into the hot oil. Do not overcrowd the pan/wok. Deep fry the florets in batches till half done. Drain on absorbent paper. Reheat the oil and slide the half-fried florets in batches into the oil again. Fry the florets till golden brown and crisp. Drain on absorbent paper. Transfer onto a serving plate. Sprinkle chaat masala over the florets. I want some.. right now,so yummy dish………..simply delicious….